"My girlfriend teaches me a lot of Hindi and Haryanvi as do my Indian friends and YouTube... I want to be able to chat with the phalwala, dudhwala, and everybody I met during my day." Karl Rock surprised people by talking to them in Hindi. Karl Rock is a New Zealand national currently living in Delhi. The founder of 'India Survival Guide' - a blog that offers a unique take on travelling in India, recently posted a video on his YouTube channel that has been making a buzz. Titled 'Foreigner Surprising Indians with Hindi', the video is a compilation of Karl doing just that - surprising Indians by talking to them in Hindi and Haryanvi. "I really love the reaction I get from Indians when I speak a little bit of Hindi to them... It's the last thing they expect from a foreigner," says Karl, accurately enough, at the beginning of his video. "My girlfriend teaches me a lot of Hindi and Haryanvi as do my Indian friends and YouTube," he tells NDTV. "But mainly I'm self-taught because I believe if I'm staying here the best way to integrate into society is through the local language. I want to be able to chat with the phalwala, dudhwala, and everybody I met during my day." Shot mostly in Gurgaon, Haryana, the video shows him holding conversations in Hindi and Haryanvi with unsuspecting locals. 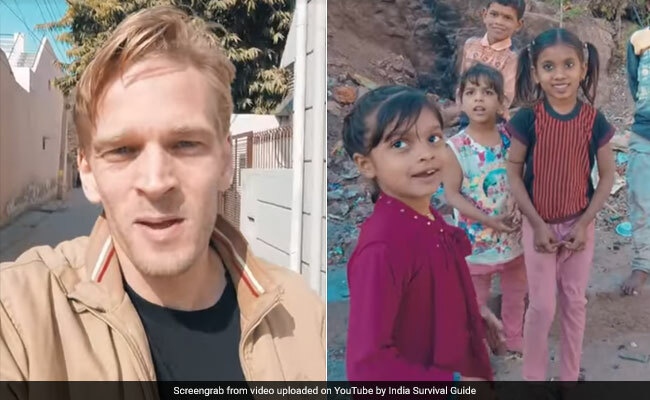 From a rickshaw driver to kids playing on the street, the video shows him surprising everyone with his almost-fluent Hindi. Their smiles of surprise and amusement will bring a smile to your face as well. Since being shared on February 1, the video has garnered over 3 lakh views on YouTube. It has also earned a lot of love from Indians and foreigners alike. "You captured such a beautiful video," writes one person in the comments section. "Woahhh! You're really good at Hindi!" says another. "I've been visiting India yearly since 2013. Last year I decided to travel all 36 states and union territories plus India before partition. I've been to 28 so far plus Bangladesh," says Karl to NDTV. "My YouTube channel started off helping foreigners bargain, avoid scammers, and drive in India. I'll still be doing that, but now it's taking a turn towards showing my life in India too," he says. Ask him to tell you more about his love for India and he says, "When I was 18, I fell I fell in love with Indian food. It began from there. I kept growing more and more interested in India until I finally visited in 2013 and fell in love with India. My stomach was definitely Indian in a past life. When I first landed in India, a local friend met me at the airport. That week he taught me how to survive as a foreigner in India."